Founded by Hiro Hashimoto after his arrival in Winnipeg in 1946, Hashimoto Construction Limited erected homes across various city suburbs for a period of nearly 40 years. Like other Japanese-Canadians in the Winnipeg construction industry, Hashimoto was born in British Columbia, on a strawberry farm. Before moving to Winnipeg, he lived in Arnaud, Manitoba. 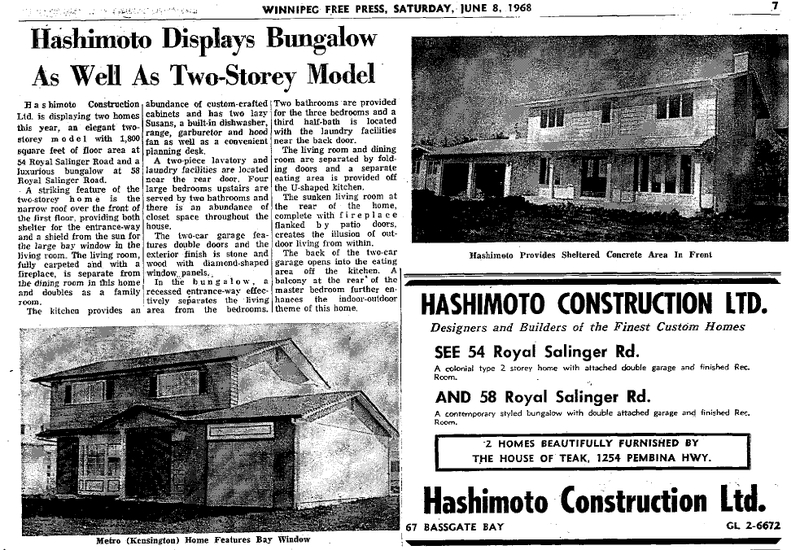 From 1950 until 1987, Hashimoto’s firm designed and built residences in Tuxedo, Southdale, Charleswood, Fort Garry and Fort Richmond and throughout Manitoba. Examples from the 1950s include homes along Charleswood’s Willow Ridge and Harstone Road, some of which were marketed on a customizable “You Choose The Plan, We Build The Home” basis. Others were advertised as “ultra modern.” Hashimoto homes were routinely exhibited in Winnipeg’s annual "Parade of Homes,” including two homes from 1968: 54 and 58 Royal Salinger Road, both in the Niakwa Place neighbourhood. The first of these, a colonial style two-storey home, was promoted as featuring, along with a rec-room, custom-crafted cabinets. The second, described as a “contemporary styled bungalow” was said to possess an “indoor-outdoor theme” featuring balconies and patio doors. For many years Hiro Hashimoto was a member of the Winnipeg House Builders' Association.